Does conflict between the West and others force us to take sides? WHAT does a retired white woman who has no direct contact with any Muslims, think about the people who are on the news pretty much nightly? It’s a question you might think playwright Naylah Ahmed asks in her new play, ‘Ready or Not’ – and with the Westminster Attack still fresh in our minds, a drama about some of the issues surrounding such reported violence could help our understanding of the world as it is. About to premiere at the Birmingham mac on Wednesday (April 5), and then going on a national tour, comprising Canterbury, London and Plymouth, ‘Ready or Not’ explores the ‘us’ and ‘them’ mentality that appears to have built up in some quarters. The play will have its longest run in London from April 11-29. 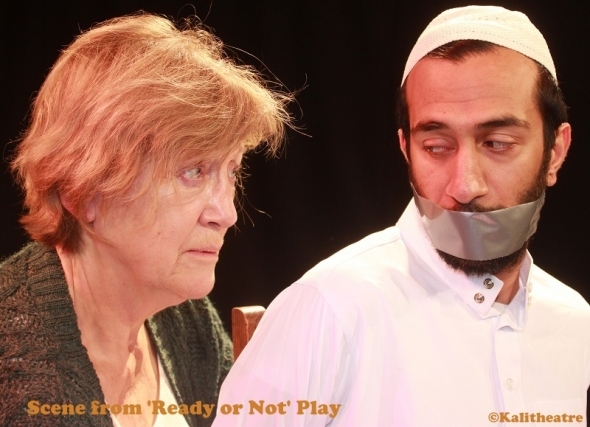 ‘Pat’ (Joan Blackman) a retired teacher is on her own in a small suburban house, when ‘Yusuf’ (Adam Karim) comes to the door with a petition. Yusuf is young, idealistic, and informed by his faith, is worried about the next Muslim country that may come under attack from the West. In this story, the pressure to take action against Iran has become imminent. “The play imagines Iran being the next target. Somewhere in Whitehall, there are talks about whether we should bomb or use drones or our military in Iran,” explained Ahmed. What transpires in the encounter between Pat and Yusuf forms the core of the drama. Pat takes Yusuf captive, for reasons that the play will explore and unpack. “Yusuf wants to take a petition to No.10 with a big group of people but he gets stuck with this person who is in a very difficult position of her own and about which he has no idea – and can have no idea, and she takes advantage,” explained Ahmed. There is tension and paranoia on Pat’s part; Yusuf is just plain scared as to what she might do next, having tied him up and gagged him. It’s certainly an intriguing set up and Ahmed is careful and apologetic not to go into too much detail, save any plot spoilers. Into this mix comes ‘Holly’ (Natasha Rickman), who is her son, Jack’s girlfriend. There are letters and phone messages and we do get to see Holly. “It’s my attempt to breakdown the ‘them’ and ‘us’ narrative. “It’s also about thinking about the concept of ‘collateral damage’ (when people not intended as targets perish in western military action, usually drone strikes), and the cycle of 24-hour news,” continued the mother, who has carved out a career in writing and radio drama producing since she left university as an English literature graduate. Arguably, there’s little doubt that the constant drip-drip reporting of violence and connecting it – consciously or not – with a faith has a negative consequences. “If your life wasn’t touched by anyone of that faith, what would you think about it?” Ahmed posed. Her first produced play, ‘Mustafa’ was commissioned by Birmingham Rep, and it was where she first developed as a playwright. It was also produced by Kali. It won a special prize at the National Theatre Foundation in 2013. Her deeply personal ‘Butcher Boys’, based loosely on late her father who ran a shop, was a joint winner of the Bruntwood Prize in 2008. Ahmed told www.asianculturevulture.com that there are certain expectations with British Asian writers and sometimes conforming to those aided a career, when in the cold light of day it shouldn’t. This Kali production is the first for new artistic director Helena Bell, who took over from Janet Bell last year. She directs ‘Ready or Not’. “‘Ready Or Not’ has similarly complex characters grappling with obsessive, difficult emotions and here played out against a backdrop of disturbing internet chat rooms. 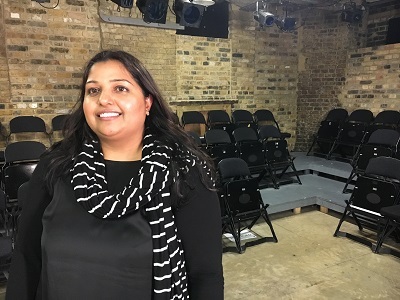 “I think the play’s gripping themes and contemporary visuals will create a stimulating and thought provoking piece of theatre for audiences around the UK,” said Bell, who is of mixed race Indian heritage.